Spray 5-quart slow cooker with cooking spray. In slow cooker, beat whole milk, evaporated milk, 1/4 cup melted butter, the salt and pepper with whisk. Add pasta, 3 1/2 cups of the pepper Jack cheese, the Velveeta™ cubes and poblano chile. Cover; cook on Low heat setting 2 1/2 to 3 hours or until pasta is cooked but not mushy. When pasta is cooked, stir in chicken and chipotle chile. Sprinkle remaining 1/2 cup pepper Jack cheese over top. Cover; cook about 20 minutes or until melted. Meanwhile, in 6-inch skillet, heat 2 tablespoons butter over medium heat. Add bread crumbs; stir to coat. Cook and stir 3 to 4 minutes or until golden brown. Sprinkle over pasta. If your crowd likes a little less heat, substitute part or all of the shredded pepper Jack cheese with traditional Monterey Jack cheese in the recipe. Any bell pepper can be substituted for the poblano chile in this recipe. 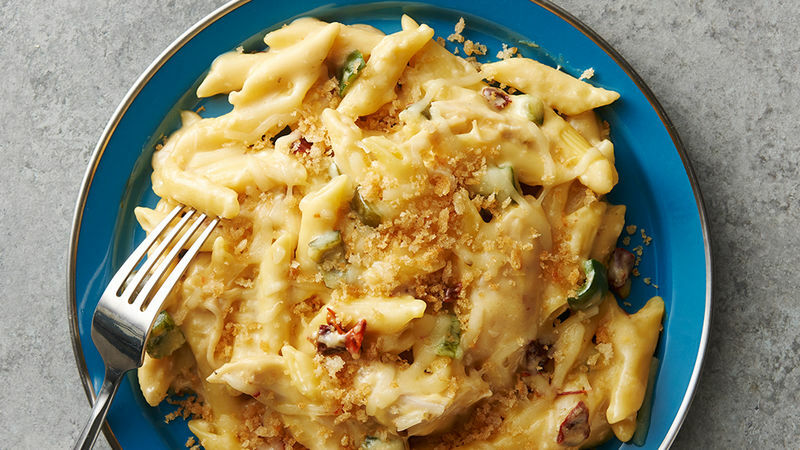 We call this slow-cooker mac and cheese “the adult version” of mac and cheese. It’s just as cheesy (if not more!) than the classic, but it brings the heat to the table with pepper Jack cheese, poblano chiles and chipotle chiles. We don’t want to take things too far, but if you are all about the spice, sneak a few jalapenos into the slow cooker. Need less heat? Feel free to use bell peppers instead of the chiles and you can use Monterey Jack or Colby Jack cheese instead. And if this recipe intrigues you but you’d like a vegetarian version, skip the rotisserie chicken and load up on veggies instead. Customize this pasta dish however you see fit or find another pasta recipe that fits your tastebuds.